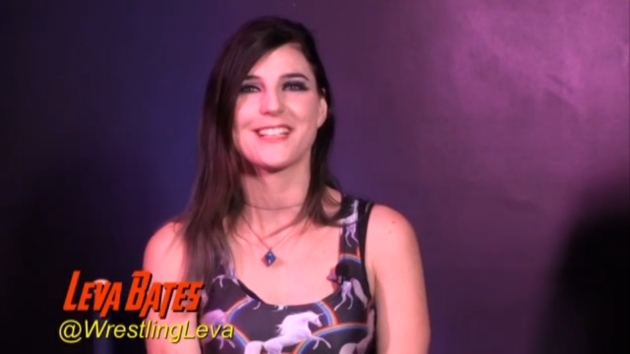 Kayfabe Commentaries is known for producing the most unique and original shoot interviews on the market today, and their newest addition, “Bombshells with Leva Bates”, is no different. “Bombshells” is the all ladies shoot interview series many of us fans have been waiting for — well, maybe we didn’t quite realize we were waiting for it. In the debut edition, host Leva “Blue Pants” Bates sits down with current TNA Knockouts Champion Mia “Jade” Yim and up-and-coming indy talent Kennadi Brink (formerly Jessie Kaye) in separate interviews to discuss everything from breaking into the business to dating fellow wrestlers and a whole lot in between. Along the way we get some fun and games and a few matches from Pro Wrestling Syndicates’ March 26, 2016 Bombshell Ladies of Wrestling 10 from the Starland Ballroom in Sayreville, New Jersey. The DVD is broken into two segments, Mia Yim and then Kennadi Brink. The first part, running just over an hour, is devoted to Mia Yim. Mia discusses what made her want to get into the business, her favorite wrestlers as a kid, and where she trained. All of this is quite interesting and, honestly, the best part of the interview. Bates and Yim are close friends, and it shows in this interview, for good and bad. While the familiarity makes for friendly conversation, it’s almost too friendly. Bates questions wander needlessly and the interview risks becoming rudderless at times. The true highlight of the interview, for me, comes when the two discuss whether it’s better date inside or outside the business. Mia Yim’s insight is invaluable to any young lady looking to get into the business. In fact, I’d say if there is one audience this DVD is tailor made for it’s that of young ladies seriously considering entering pro wrestling. The advice and hard truths in this DVD will certainly give any girl with bright wrestling dreams a lot to chew on. The wrestling portion of Yim’s interview doesn’t last all that long. Instead Bates introduces a series of “Top Five” games including comic book heroes and Will Smith movies, among others. I’d like to say I enjoyed these as I do the games in “YouShoot”, but I can’t. With talk of “cosplay” and inside jokes that need explaining, this interview feels more like two old friends meeting over coffee (with the viewer as a third wheel) than a true shoot interview. It’s hard not to feel that an opportunity was missed to learn about the life and career of the talented Mia Yim. 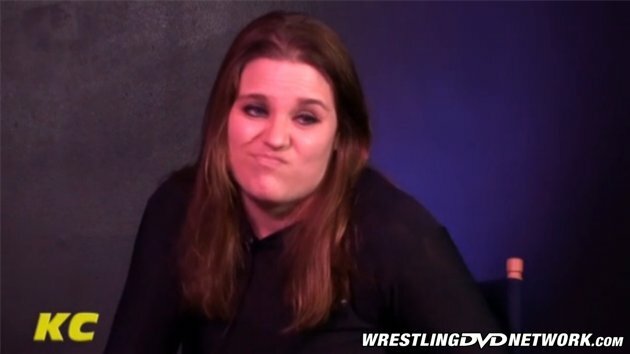 The second portion of the program features Leva Bates’ interview with 24-year-old Kennadi Brink. The discussion is similar to the previous interview in terms of content, but the tone is dramatically different and it’s far more focused (with only a single game of “Top Five” by the way). Aside from the usual, Brink describes training at the renowned Team 3D Academy, what it’s like changing your ring name, and working odd jobs to get by. A solid interview that runs about 40 minutes. Along with interviews “Bombshells” features three matches. The first pits Mia Yim against Kimber Lee in a match I very much enjoyed, while the second match is a sort of “cosplay” Star Wars-themed bout featuring “Darth” Veda Scott versus “Princess” Leva in a match full of Force spots and flubs that fall a little flat. Conversely, the final match features Kelly Klein against Kennadi Brink in a match that shows Brink to be a confident, well trained heel with a very bright future. At 2 hours and 24 minutes, the debut edition is a mixed bag. If you’re looking for mature conversation, you won’t find that here. Someone ought to do a better job preparing questions, as it takes nearly as long to ask a simple question as it does for the ladies to answer them! I’m also not sold on separate interviews. I personally think a group discussion, at some point in the program, would have made for a more entertaining and insightful DVD. Having said that, there is a lot to like about this. Both Mia Yim and Kennadi Brink come off as intelligent, talented young women dedicated to the sport of wrestling, something the matches only reinforce. While “Bombshells” is still a work in progress, it is fun and illuminating. If you know of, or are, a young woman looking to break into the business this DVD is must-see material. Brink and Yim go through the real-life choices and changes, sacrifices and defeats that accompany being a women’s wrestler in the 21st century. “Bombshells” isn’t for everybody. Kayfabe Commentaries fans will no doubt enjoy the DVD, but casual fans may not. “Bombshells with Leva Bates: Mia Yim & Kennadi Brink” is out now! Get a physical DVD copy or stream it instantly On Demand through KayfabeCommentaries.com.